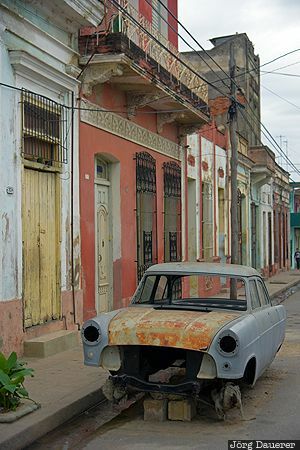 The wreck of a classic car in front of the colorful decaying facades of Cienfuegos. Cienfuegos is the capital of the province Cienfuegos in the south west of Cuba. This photo was taken in the morning of a cloudy day in March of 2016. This photo was taken with a digital camera.